When I received some bizzybee cleaning products to try out for Mummy News I knew they would be useful as having two little ones in the house we are constantly cleaning up after them and without a dishwasher we do the washing up by hand. But what I particularly loved about the bizzybee products was how stylish they are – I’m always tempted by the look of things – ok image isn’t everything but if I was offered a pink or a blue dish cloth, the pink cloth would win. So after admiring the array of glamorous pink gloves and sparkly scourers I couldn’t wait to get stuck into the housework to see if the rather good looking products performed as well as they looked. The first product I tried was the scourer as the one on my the kitchen sink was fit for the bin!! And what a gorgeous looking scourer it is. So sparkly I loved it (the picture doesn’t do it justice). But would it give results – well my husband was the first to do the washing up and he was very happy. It had enough power to get through stuck on food without being too scratchy that it would damage anything. It seems very durable and when it gets scrunched up, always pops straight back into shape. So far we are very pleased with it. I then decided to try out some of the gloves and started with the multipurpose ones which come in a lovely deep shade of purple. They are extra durable with a raised grip on the palm and fingers. These as well as all the others I tried below are all considerably thicker and stronger than the current pairs of gloves I am using at home which is a big positive as we get through quite a few. They fitted well across the hand and fingers and to be honest are the perfect pair of household gloves which I found ideal for cleaning the bathroom. The next two pairs of gloves that I tried out are latex free making them suitable for sensitive skin. Both these come in gorgeous pastel colours, a soft peach for the standard latex free gloves and a pearly white for the moisturising latex free gloves. They come with pretty detailing around the tops and a lovely silver bizzybee logo. I then tried them on and my fingers melted into the soft, velvety, luxury lining – absolutely gorgeous!! Although they feel tough and strong, for me personally I wouldn’t be able to use these for really dirty jobs, I would keep them just for general cleaning when I need to protect my hands and nails. I have never come across a household glove that looked and felt so good – Absolutely beautiful!! 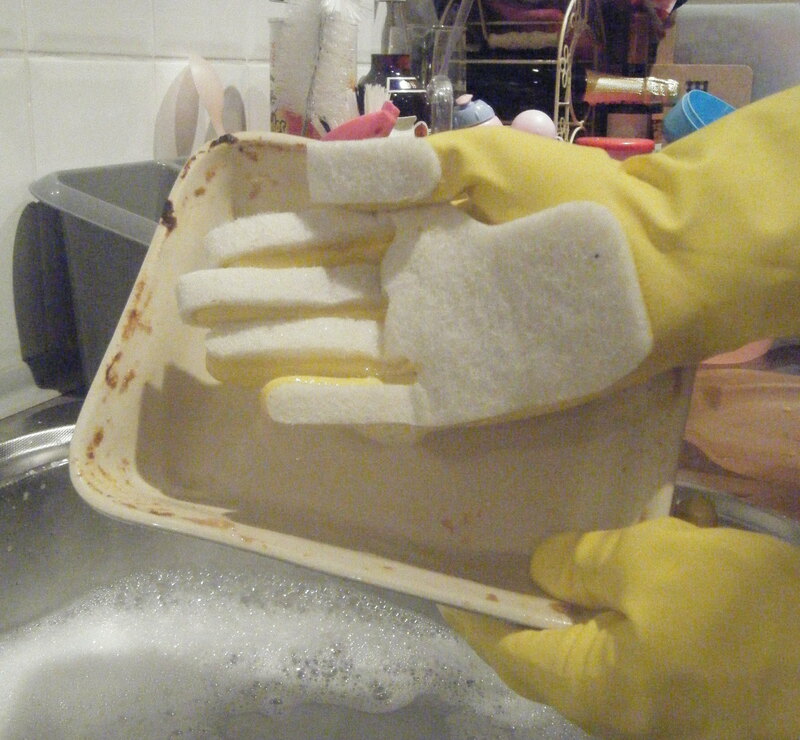 My husband took on the challenge of trying out the rather gimmicky looking scourer gloves. This rather unusual pair came with scouring pads attached to the right hand and the left hand glove was as per a normal one. At first he found these rather strange to wear and couldn’t get used to not picking up the scourer but once he got going found them useful and a bit quicker having a 2 in 1!! He found it particularly easy with the cutlery although did find it a little harder to pick up some larger items with the scouring hand. I also got him to test the black heavy duty gloves which where just the job for cleaning the outside windowsills and some disposable vinyl gloves which he used whilst doing some work on his bike. Although transparent to start with they ended up covered in thick black oil so it was great that they were throw away and left him with grease free hands. I found the bizzybee multipurpose cloths to be quite impressive. We had two varieties, a green traditional perforated style ideal for bathrooms and sinks. These felt quite strong so wouldn’t rip whilst using. The other style was a delightful red and white spotty more absorbent cloth great for wiping surfaces and spills – just what I need with two little ones around the house. What I particularly loved about both these cloths is that they are machine washable – how fab is that? To keep them fresher and lasting longer is definitely a bonus for me and so far, they are cloths that I would recommend. When I saw the pink glamourous gloves I was in love. What a fabulous looking pair of gloves that are both practical but a bit special, textured hearts across the palms, curvy shaped tops and a gorgeous hot pink colour. This is my ideal glove – (although I do love the luxurious lined ones). 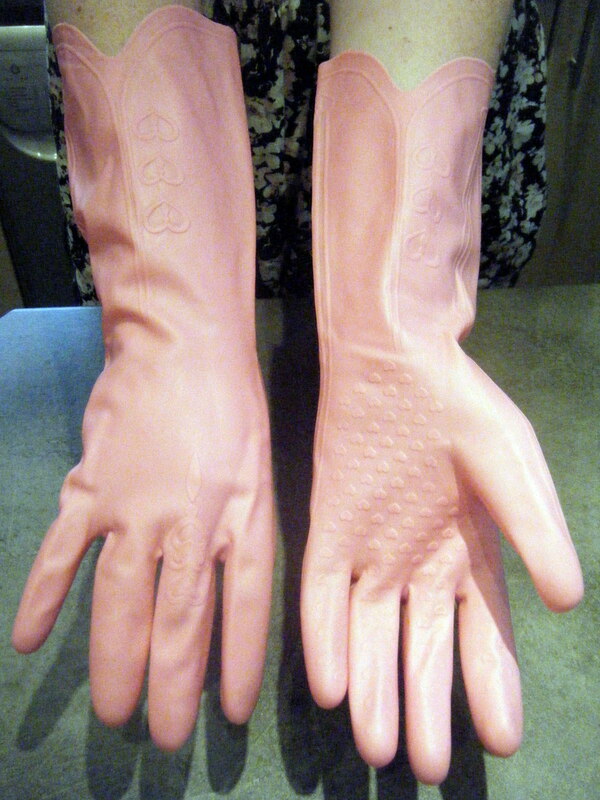 I chose to use these as my washing up gloves and they are great – thick, durable but with a girly twist. They are practical in every way possible but have that glamourous style that makes you feel good doing the most menial of tasks. The microfibre cloths came in a pack of 3 but unusally it contains three differently textured cloths – 1 for streak free shine, 1 for wiping and 1 for absorbing. I love this idea of including a variety for different uses. 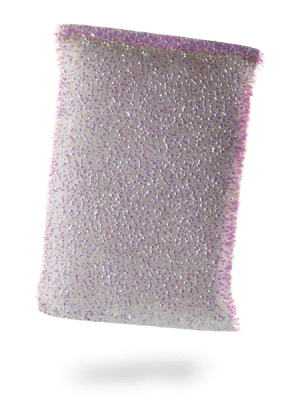 I do currently use a microfibre cloth but only for dusting – what I didn’t realise was that they are suitable for a multitude of cleaning across the home and in fact I am rather impressed by them. I have been using the blue polishing cloth for my windows and mirrors, the fluffy green cloth for the bathroom which has been great for cleaning the bath and sink, and the purple textured cloth is great for wiping up after my children – great for getting all the stuck on food off their plastic table and wiping around the highchair. 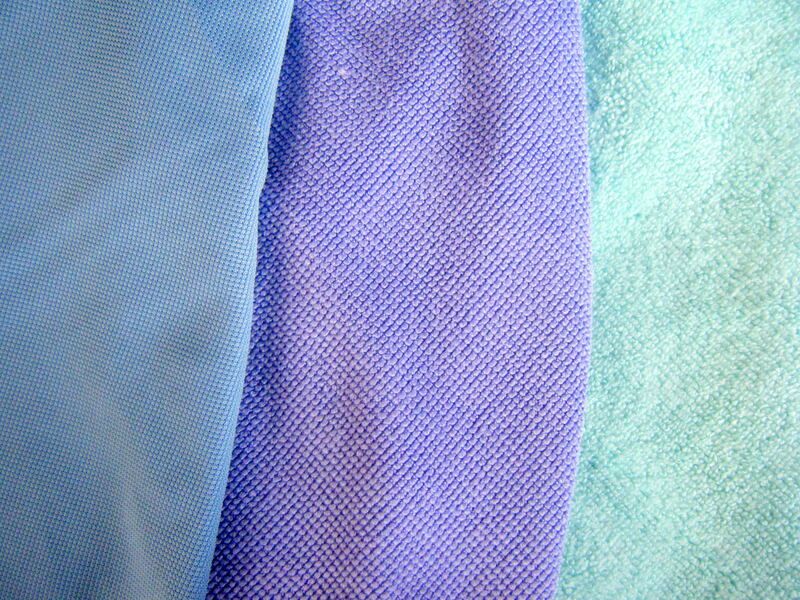 And again these cloths are machine washable up to 40°C – I love them – microfibre is definitely the way forward. Overall I am very impressed with the bizzybee product range both in the stylish stakes and the performance/durability of them. I would definitely purchase these again in the future and highly recommend them.